What game made you cry? We're all friends here. You can admit it. Sometimes, games are sad. Plenty of games succeed at scaring us, thrilling us, or making us laugh, and sometimes they make us cry too. Maybe that unexpected twist in Final Fantasy 7 got to you as a kid. Maybe it was a classic tearjerker like To the Moon, or Rakuen, or Brothers: A Tale of Two Sons. Our PCG Q&A this weekend is: What game made you cry? Let us know in the comments below. What Remains of Edith Finch helped me grieve after my grandmother passed away because of some eerie similarities I share with the game. I can visit nearly all my ancestors on my mom's side of the family in a single cemetery, and I've been visiting them ever since I was two years old. It's how I learned stories about family members I never met. My grandma is now buried among all of them, and she was to me the same way Grandma Edie was to Edith. One day my mother will be buried there as well, per her wishes. I'll take my future children there to visit the graves and tell them stories about their ancestors, like how Edith told the stories of her family to her son. I've only played What Remains of Edith Finch completely through twice, but it's the kind of game I play when I need a cathartic moment. I don't remember a game ever making me cry, honestly. I did once cry because of an episode of Baywatch, but I was a child and it was pretty dramatic. Anyway, that's a story for another time. I probably got misty at least one of the times I finished Final Fantasy 9, a game near and dear to my heart. But the most vivid memory that comes to mind is the finale of Bastion, when I chose to save Zulf. I don't want to ruin the moment for anyone who hasn't played Bastion, but I remember being stunned and overwhelmed by the power of that moment, how all the narration and music in the game culminated in that sequence—and then had the restraint to pull back and be quiet. My heart was full. A game has never made me cry, which I find a bit odd since movies, novels, short stories, and television dramas all have. Television comedies too, sometimes. The end of pretty much every episode of Great British Bake-Off has me welling up. And even commercials have made me shed some tears. Remember that eBay commercial where the kid loses his toy boat and then finds it on eBay and he's like a middle-aged man now? Damn it. Not games, though. I think it may just be that I find games unconvincing. Often—not always, but very often—the writing, voice acting, and animation simply don't transport me to a place where I can even come close to forgetting it's a game. Maybe it has something to do with the fact that I'm participating in the game instead of just bearing witness as I am with a movie? I tend to not be in great touch with my emotions in real life, so maybe I bring that along with me when I play. In other forms of media I'm not involved so I can completely get swept up in whatever it makes me feel. The first game that made me cry was The Walking Dead. It was also the most recent to make me cry, because I just finished The Walking Dead: The Final Season and those floodgates reopened. Other games make me blink and sniffle a bit, like the Mordin scene in Mass Effect 3 or the part of Bastion Wes referenced, but The Walking Dead makes me actually sob. Something about substitute parental figures making sacrifices for adoptive children gets me. 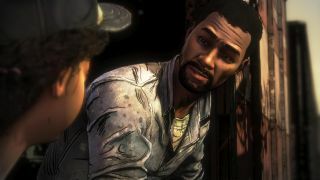 What's great about playing all of The Walking Dead is you get to experience that as Clem's pretend father Lee in the first season, then by The Final Season you're playing an older Clem struggling to fill the same position for her sort-of-son AJ. It was a classic dad game and by the end it evolved into a classic mom game (with a weird third season where it was about being an uncle). A game has never made me cry either, but then I haven't cried at a piece of media since the Futurama episode with the dog (which tries so hard to make you cry it might as well be spraying citric acid in your eyes). Plenty of games have moved me, though, like Gone Home, parts of Fallout 3, Edith Finch, the original Mafia, and even Final Fantasy X, though I was a teenager when I played the latter. Mass Effect 3's Liara mind meld also brought me pretty close, but even that wasn't enough to make me drop my tough guy facade.